This blog is for all those adventurous craving couples!! This is my plea to you all who are willing to hike trails, climb a few rocks, and stand on top a waterfall for beautiful photos! Why would you do this? The above photo should be enough, but if not, I want to evoke emotion with the surroundings being a little dramatic. I am a nature lover who loves the mountains, and to know that there are mountains and an ocean like lake right in the Midwest is pretty darn awesome! I will be sharing more of this awesome session, but right now I want to let you know on a little secret. This secret is, if you love mountains but don’t want to fly across country to get there, all you have to do is travel to the North Shore of Minnesota! 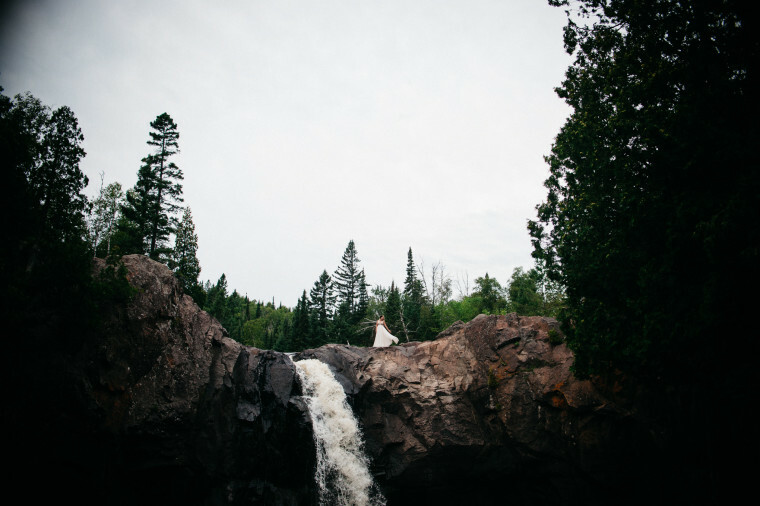 Hike a little trail and get married on top a cliff, mountain or next to a waterfall. This intimate affair is for the people who want to express their love and vow it to each other in front of their very favorite people. I have gotten to photograph weddings with less than 50 people invited, specializing in capturing moments in an intimate setting. What is more intimate and romantic than beautiful trees, rushing water and twinkling lights to dance under? Nothing at all! I know there are people out there in this great part of the country we all know as Gods Country who adore the mountains, but don’t want to travel or worry about getting everything and everyone on a plane. Just pack up a truck and van travel the beautiful road to the North Shore. Hike along the Temperance River, take a leap of a cliff into a pool of cool water, skip rocks on a calm beautiful day on the Superior. Oh man, can’t you picture it?? ?